The Ithaca College men’s and women’s track & field teams traveled to Utica, New York on Jan. 12 to compete in the Utica College Invitational. Throughout the day, the women’s team had a lot of success. Freshman Lauren Lobdell came in eighth in the 800-meter run with a time of 2:36. 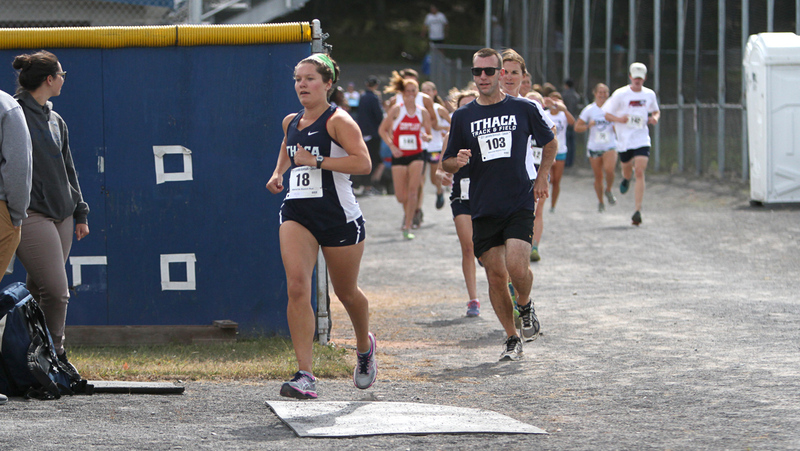 In the women’s 4×400-meter relay Ithaca’s ‘A’ team came in second place with a time of 4:22.08. The team consisted of freshmen Kristina Hoefler and Lobdell along with junior Lindsey Scott and sophomore Sarah Lachenmayr. The South Hill squad excelled in the field events. Four members of the women’s team placed in the top five for the women’s pole vault. Freshman Meghan Matheny claimed second with a height of 3.70 meters. Sophomore Juliann Terry came in third with a height of 3.50 meters and sophomore Emily Carey was fourth with a height of 3.20. Sophomore Julia Nomberg took fifth place with a height of 3.05 meters. In the shot put, freshman Jaylin Rumsey came in 18th after throwing a distance of 8.78 meters. Junior Brianna Bussiere also came in sixth place in the 60-meter hurdles with a time of 10.75 seconds. The men’s team also had a good performance during the meet. During the 800-meter run, freshman Tim Cook came in sixth with a time of 2:10. Sophomore Jack Culhane came in eighth place in the 400-meter dash with a time of 55.51 seconds. In the 200-meter dash, junior Austin Beaudin claimed 10th place with a time of 25.08 seconds. Sophomore Zach Woodruff came in sixth place in the 60-meter hurdles with a time of 10.33 seconds. The men’s team, just like the women’s, had four people in the top five for pole vault. Freshman Dominic Mikula came in first with a height of 4.65 meters, followed by freshman Andrew Fudala who cleared a height of 4.50 meters. Junior Joey Nally came in third with a height of 4.20 meters and senior Martin Desmery came in fourth with a height of 4.05 meters. The Bombers will continue their season when they face SUNY Oneonta, Moravian College and SUNY Brockport at 1 p.m. Jan. 19 at the A&E center.